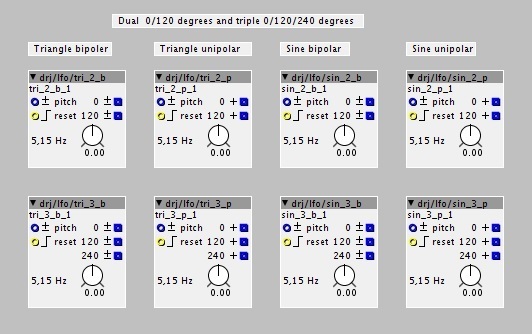 dual_sine is a dual sine oscillator with outputs at 0 and 90 degrees. 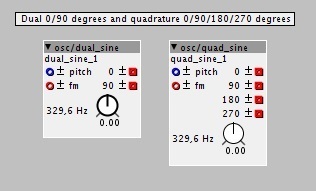 quad_sine is a quadrature sine oscillator with outputs at 0, 90, 180 and 270 degrees. This is a family of bipolar and unipolar LFOs with one two or four outputs at successively delayed phases. All of them have pitch and phase reset inputs, and the single sine lfos also have phase inputs. In development, subject to changes based on feedback. Note that if modules in a patch, or any of its sub patches are added, removed or changed, then the presets will no longer load correctly for the changed (sub)patches. Also be aware that on saving, you will get a glitch in the audio as the SD write blocks for a moment. 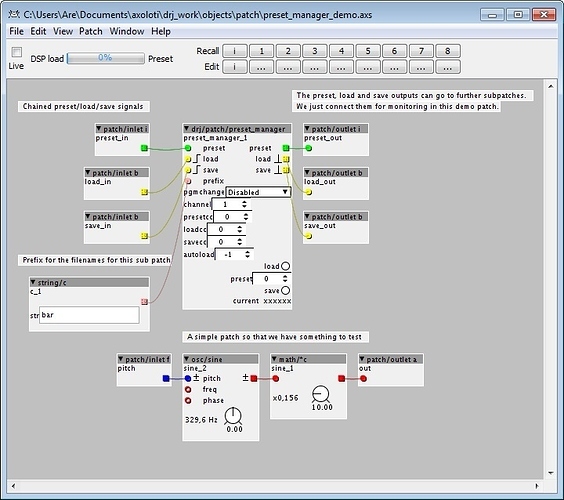 1 - Using MIDI by sending standard program change messages. 2 - Using MIDI by sending designated CCs set the preset number and trigger load and save operations. 3 - Using the preset number spinbox, load and save buttons on the module for managing presets from patch windows. 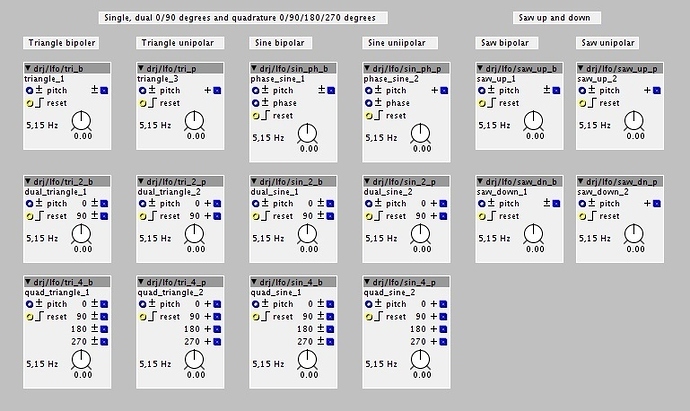 4 - Using the preset, load and save inputs to set the preset number and trigger load and save operations. The pgmchange menu enables or disables MIDI program changes. 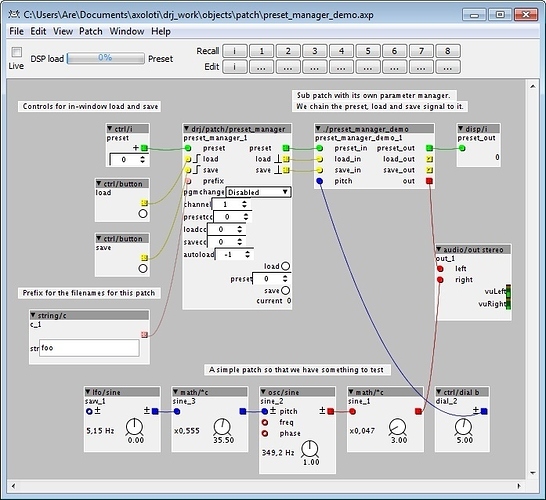 The channel spinbox sets the MIDI channel that will be used for MIDI control. The presetcc, loadcc and savecc spinboxes selects the MIDI CC numbers used for controlling the preset manager. The preset number to load or save is set with presetcc, the load action is triggered by loadcc and the save action is triggered by savecc. Set the CC numbers to -1 to disable their corresponding functions. The autoload spinbox selects a preset number which will be loaded automatically when the patch starts. Set autoload to -1 for no preset to be loaded. 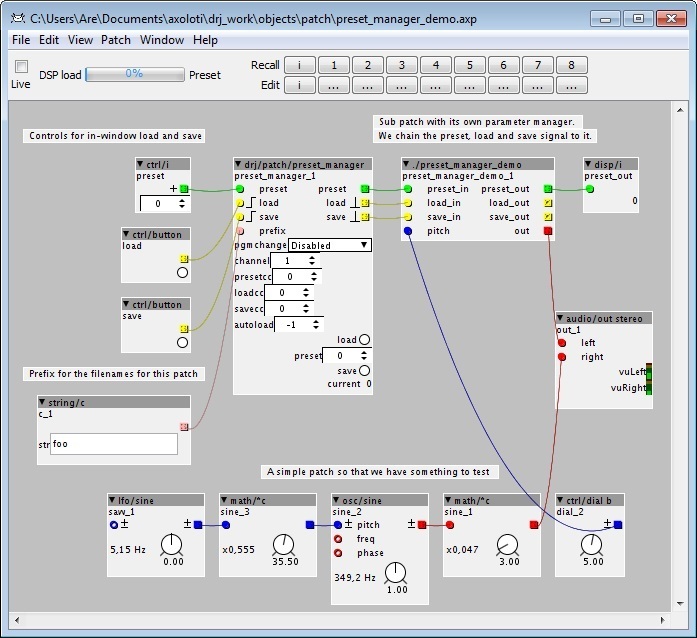 The preset spinbox, load and save buttons control the load and save operations directly from a patch window. 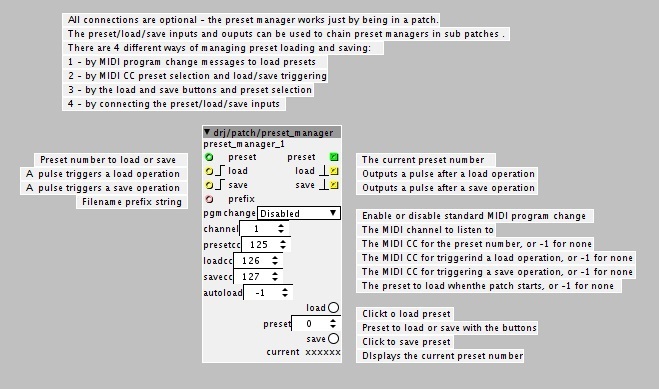 The preset output and the save and load pulse outputs can be used to chain save/load actions to sub patches by connecting to the corresponding inputs of other preset managers. If managing presets by MIDI only, the preset managers (in the various sub patches) that listens to MIDI does not need to be chained together. When a preset manager gets a change message via MIDI, it will not send save/load pulses to avoid multiple load/save triggers. This means there are 1000 preset slots, although only the first 128 can be accessed via MID (for now). It's not perfect I'm, afraid, but it's a start. I really want to add a mode where one preset manager can save and load the parameters for all sub patches. The current per sub patch way would still be useful as you can selectively save and load presets for the various sub patches. E.g. in a performance oriented patch, you could load different synth sub patch presets and fx sub patch presets at will, using MIDI or some dials and buttons in the top level patch window, while leaving other sub patches untouched. Couldn't you just connect a ctrl/i to the preset objects in all of the subpatches to change presets on all of them simultaniously? BTW, Is the preset object DSP hungry? Yes, you could just use route some dials and buttons to the control inputs of the preset managers throughout the sub patches. That's how I plan to use it. It's also a possibility to use it just on the top level, and then use "parameter on parent" to expose the controls you want saved and loaded in the top level patch. How to set that up on top level If the object itself is included in the saved state? The preset manager does indeed save its own parameters (it just has three parameters: preset, load and save buttons - the other ones are attributes and are only saved with the patch). This is not a problem though, the built in load and save buttons are negative edge triggered (action happens when you release them) to avoid any undue effects of that. At one point I had the module skip the saving of its own parameters, but for several reasons it was better to go for action-on-release buttons on the module and let things work 'naturally'. Thank you so much for the preset manager ! Works pretty well on its own. 1 - Saves parameters as name/value pairs , and so it should not be dependent on the order/placement of objects in the patch. 2 - Introduces a new attribute called "savemode". 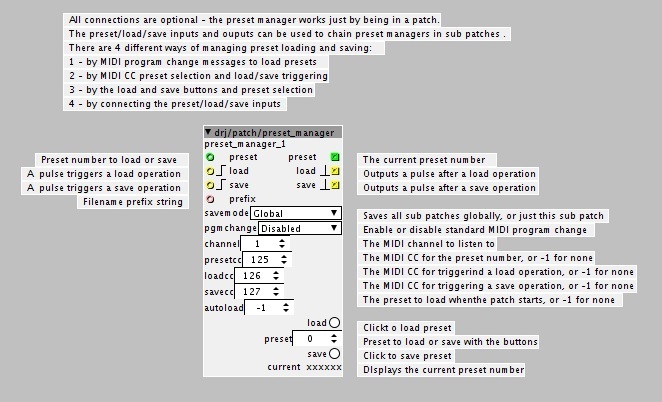 The "Global" mode allows a single preset manager to save all parameters in the patch, including all sub patches. The "SubPatch" mode works like the previous version, except for point 1 above. Edit: I just added a third save mode "SubPatchV1", which is the exact same functionality as the first version of preset manager. While I'm keen on the added integrity name binding gives, missing the integer spinbox parameter (and possibly others) is not so cool, and I'll leave this option in until full integrity can be ensured for the other modes. There is currently a drawback to implementing point 1: some parameters aren't currently being registered by the patches (in xpatch.cpp), and they will not be saved. When this issue/bug in the Axoloti base software is fixed, all parameters will be saved as expected. Currently I have identified the integer spinbox (ParameterInt32Box) as not being registered, but there could be others. If you test this object, please watch the Axoloti console and see if it reports any skipped/missing parameters on save/load in SubPatch mode (in Global mode this can't be easily detected unfortunately) - if you spot any other non-registered parameters, recognized by not being updated on a load, please report here. Apart from the missing parameter type(s? ), it now works better, since data integrity is helped by storing the parameter names. There is one problem with that though: in Global mode, two equally named parameters in different sub patches will create confusion. This can only be fixed if the patches store a list of sub patches (in xpatch.cpp, I'm discussing this elsewhere with tb, and I'm hoping this can be included in the next Axoloti version). Given a fix for the non-registered parameters and a sub patch list, this module will perform complete preset management, like we're used to from most synthesizers. The file format version has been bumped from 1 to 2. If you have saved data with the previous version, it should still be loaded back, but that support will be removed with the next update. In the files, only a hash of the name is actually saved. Large set of constants, most economical way to store/recall? These switches were made to cover for switchable FX routing in my patches, but they can of course be used for anything requiring the provided switching functionality. The fm4op_alg object is for building 4 operator FM synthesis patches ala TX81Z. 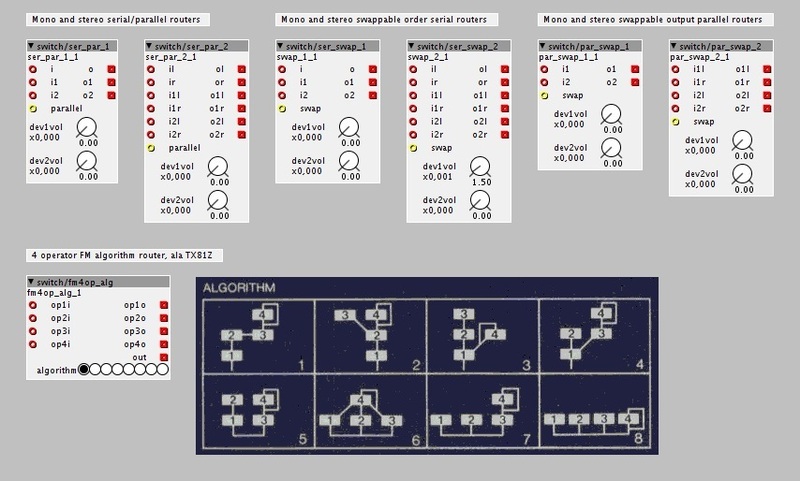 It has the 8 algorithms that the TX81Z has, with the difference that all leaf operators have a feedback loop available, not only operator 4 as in the TX case. If you do not want feedback, just turn down the modulation index for the operators in question (that would be part of the operators you supply). Not sure if you take requests , but is there any chance of a triangular and sine LFOs with 120 degree phase outputs? those would be useful to create Solina-like "triple-chorus" effects. Thanks! Hey DrJustice , did you remove the preset manager from git ? ^ The preset manager is back. I don't know why it was gone (but it's a good thing: I want some other objects to be gone, or rather moved to different folders - must talk to Johannes/tb about this). This is an extension to the family of bipolar and unipolar LFOs, this time with two and three outputs at successively delayed phases, 0, 120 and 240 degrees. All of them have pitch and phase reset inputs. you removed it, in this commit... perhaps an accident? changed 9 files with 496 additions and 1164 deletions. the only disadvantage with removing, rather than moving it you can loose the commit/change history. so if you need things moved, you can do this directly with git tools, or PM me if you need a hand. Ahhh... yes, I should've checked the git history. I did the move from here - seems fine in the repository.